Tarps provide great weather protection while camping, whether from the rain or sun. Following are some tarpaulin set ups ranging from small and simple, to massive! Looking at other people’s camping set up always inspires me to make my own set up better. I have ordered the photos in terms of size and complexity. The larger set ups on this page take some time to erect, so should only be considered if you are camping for several days. Instructions on setting up a tarp can be found here. 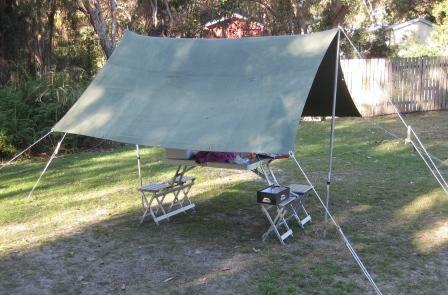 The set up I used on Stradbroke Island at Adder Rock Holiday Park was very simple. I used only two poles, six guy ropes and pegs, and an 8′ x 10′ tarp. It took about five minutes to set up and provided some useful shade for eating meals at our camping table. Instructions for this set up can be found here. 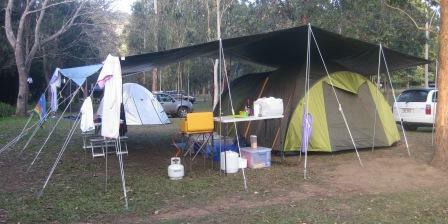 When we went camping at Lake Ainsworth Holiday Park with some friends, I set up a 10′ x 12′ tarpaulin in the same manner. A 10′ x 12′ tarp is about the largest you can set up using this simple method. The shelter was relatively stable in a moderate breeze, but there was a small amount of sag in the ridge because there was no ridge pole. The main disadvantage of the simple set up method is that the guy ropes spread over a large area compared to the shelter area provided. Because there are no poles supporting the sides (only poles supporting the peak), the sides hang fairly low. I set up this 12′ x 16′ tarp on my front lawn to practice setting up. I used eight poles and a ridge pole, and double guy ropes on each corner. Instructions for this set up can be found here. The 12′ x 16′ would only cover a small tent, but would be useful size for providing shelter from rain and sun at a camping site. The set up using the ridge pole is fairly stable in wind and sheds rain water easily. I used a 20′ x 24′ tarp while camping at Borumba Deer Park to cover our 10-person Jackaroo dome tent as well as provide some shelter for our camp kitchen and table. The 20′ x 24′ has been set up with a ridge pole, including a supporting pole under the middle of the ridge. Note that I have pulled a V in each side of the tarpaulin to eliminate spots where rain water might pool. During some strong winds one night the tent flapped noisily, but the tarp was solid and held up well. 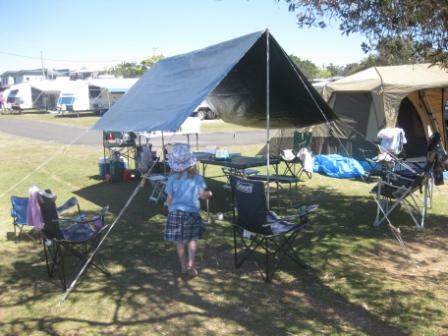 The last photo is of a huge tarp at Dicky Beach Holiday Park on the Sunshine Coast. Unfortunately I do not know its size, but my guess is that it is around 30′ x 30′. The owner of this set up has this particular camp site booked every year for one week in the September school holidays. The tarp filled the site, with the guy ropes only just fitting in his site. Two ridge poles were used under the middle of the tarpaulin, with two support poles for each ridge pole. Note the Vs along each side used to eliminate points where rain water might pool. 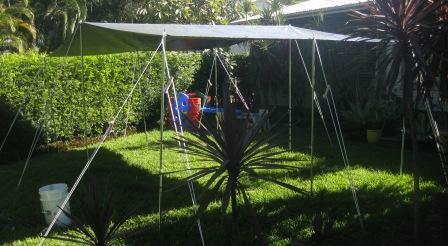 Lightweight blue poly tarps were tied to the side to provide wind protection. Underneath the shelter the owner had two tables, a large camp kitchen, an assortment of surfboards, and a huge dome tent. Did I mention that he had a family of two adults and five children? A tarp this size can be very susceptible to wind. In a strong breeze, it will become a very powerful kite. In the breezes that we experienced on this camping trip, the middle of the tarp was lifting off the middle of the ridge poles. Some people suggest tying a rope over the top to try to limit this happening. If a tarp is able to lift a pole off the ground, it will be prone to collapsing. Nice tarp set ups. Thanks for the photos. Will you do more photos of tarp set up while camping. It is wonderful to see the methods and how to get the most out of a tarp set.